Home Growing Vegetables Great Pumpkins: Eye Candy and Great Eating! Some stylish pumpkins rockin’ the boardwalk. Rotting remnants of October’s once artfully-carved pumpkins stain a stoop or two on my quirky island, but for the most part, the jack-o-lanterns of All Hallows’ Eve are bedding down for the winter in a comfy compost pile. And yet in my home, the really great pumpkins, the culinary kind, take respite from the rain and chill on a mantle, plant stand, pantry shelf, or as an occasional doorstop, all awaiting their delicious destiny in a soup, pie, gratin, puree, bread, muffin or cheesecake. Here’s a list of some of my favorite edible pumpkins (though Iran is yet untested, and untasted). This once rare wonder from Down Under is now readily available from several heirloom seed sources. The plant is vigorous and the small to medium size pumpkins many. Another greater roaster, this squash boasts a solid meat interior with a very small seed cavity. 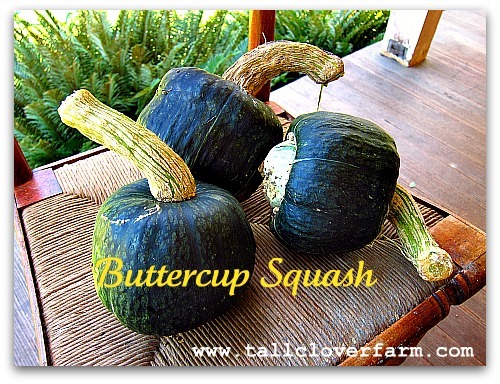 Prolific Buttercup (Burgess) squash is a nice choice for the small garden and those liking a serving size squash. It’s perfect halved and baked, or stuffed with wild rice or savory bread custard. 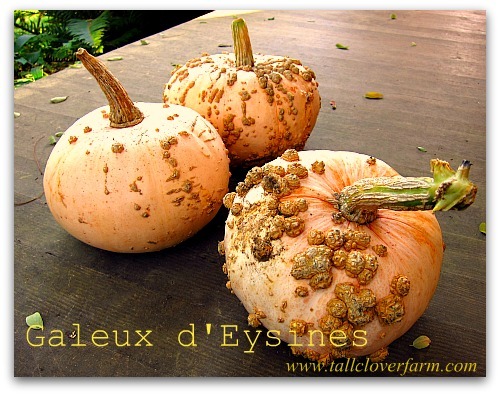 Galeux d’Eysines pumpkin, a perennial favorite of mine, bakes up nicely into one fine pie, and has also been known to bring home an award or two. Beneath its warty complexion (caused by sugary starches), you’ll find a rich flesh perfect for roasting and pureeing. 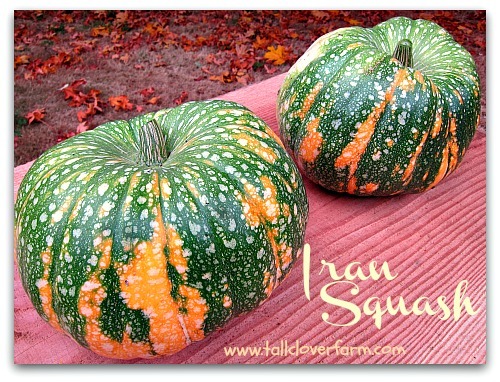 This is the first year I’ve grown Iran, a stunning squash unmatched in outward appearance. As for its inward qualities, the jury is still out. From what I’ve now read, the uncommon squash is a bit watery and flavorless. At some point, I’ll venture to cook it, but at this stage in the season, I’d much rather look at it then to eat it. Even if this Middle Eastern beauty cooks up short, it’s too beautiful not to plant again. 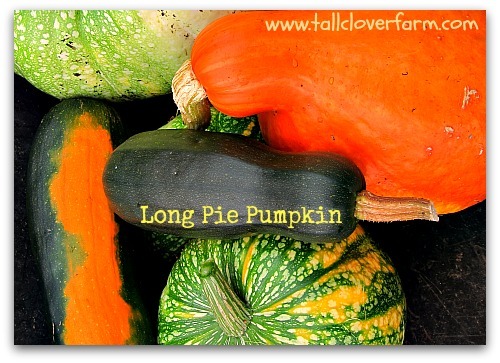 I discovered Long Pie pumpkin through my dear friend and baking buddy Deborah. She swears by them, which is good enough for me. The Long Pies are much like a giant zucchini though they do turn orange when fully ripe and tend to be great keepers that just happen to be stackable. I had a meager crop this year, due to their poor placement in the garden and my intermittent watering schedule. 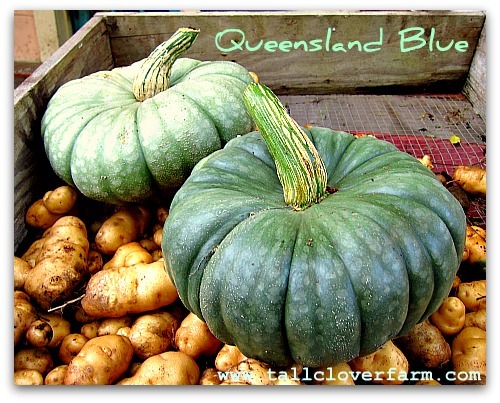 Queensland Blue pumpkin is another veggie work of art, and lucky for us, its deep lobes of jade hide a sweet orange flesh perfect for pies, soups, roasts or jams. And, it’s a very good keeper. (Taters are Makah Ozettes, a NW heirloom.) Sweet meat is a sweet choice, and an heirloom pick from the Pacific Northwest. It’s never failed me, grows easily in cool climates to a manageable size, and keeps longer than any other pumpkin I grow. 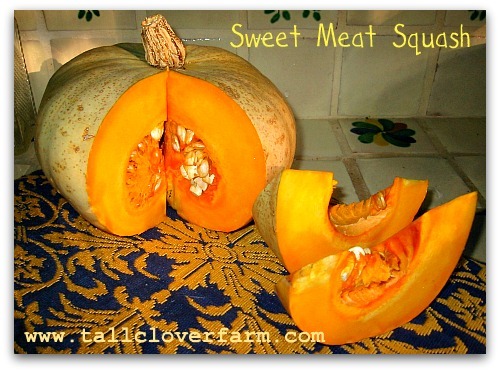 If you wish to make pumpkin pie for Easter dinner, plant Sweet Meat in June. 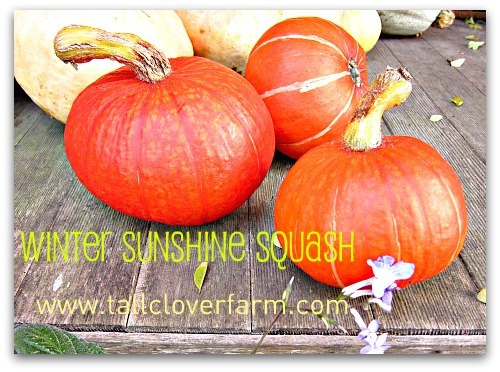 Another great vine for the small garden, Winter Sunshine gives you more squash for your square foot, producing (at least for me) five to six softball-sized fruit per vine. In the eye candy department, I know of no deeper-hued squash and one that delivers an equally delicious punch to the palate. 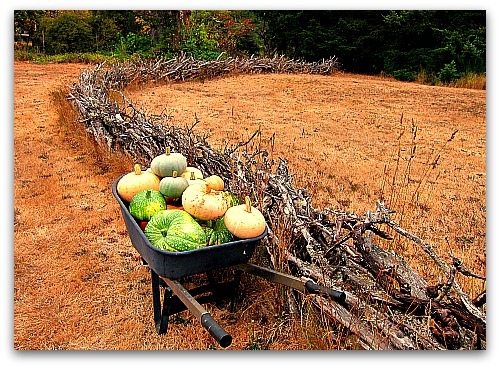 Happy trails to you, and may your wheelbarrow always be full of pumpkins. Love your photos and prose, as always. Helen, that’s good to know. I thought Rouge Vif d’Etampes were purely ornamental. You learn something everyday. Merci! How many pumpkins can one man eat? Please tell me you have a master plan. 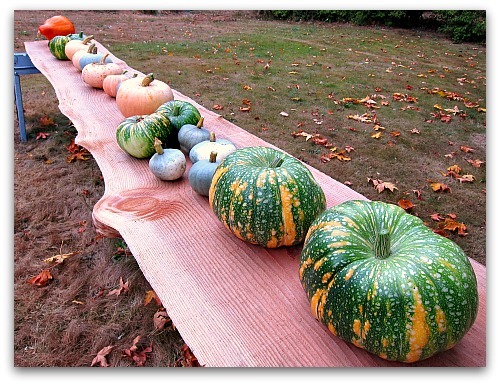 I might try to plant some of those stackable pumpkins next year in my 10X10-foot yard. What a lot of different pumpkins! You do grow a lot of them! I love all of the colours, sizes & names too! So special. You only see 3 or 4 different sort of pumpkins over here: too bad 🙁 Thanks for the tips on how to use them too! Always good to see lists of people’s favorites in the vegetable category. And that fence in the bottom picture–WOW! Is it yours? pumpkin, pumpkin, pumpkin…Tom, I love your photos. Now, I’m waiting your beautiful recipes with pumpkin. Thanks. Hi Tom – I happened upon your site some time ago and have enjoyed it ever since. I’m from Colorado and my husband and I like to grow Triple Treat pumpkins. They have a wonderful crackly exterior with a nice flesh and hull-less seeds that pop like popcorn in the oven. We carve them, eat the seeds, and bake them into pies, breads, and cookies. Another gardner gave us a Long Island Cheese pumpkin that looks very similar to a Cinderella pumpkin but has deep orange flesh and is the ultimate pumpkin pie pumpkin. Just one pumpkin resulted in about 16 cups of purée. They are dense and compact and truly delicious. You should try your hand at some Triple Treats. I think you would really like them. Thanks for letting me join the conversation. Keep up the great site. Hi Crystal, and thank you kindly for your visits and warms words, and oh yes, this awesome new pumpkin I’ve never heard of. I better expand the pumpkin patch for next year to include Triple Treat, Long Island Cheese, as well as another newbie (to me) Winter Luxury pumpkin. Thank you again! 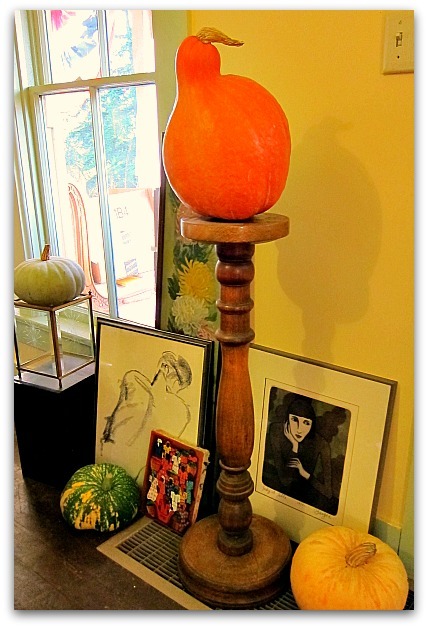 Tom – what a beautiful selection of squash and pumpkins! It looks like you will be very busy in the kitchen! If you have the space next year, I can heartily recommend trying two varieties of butternut that were new to me this year: Fairy, which I bought from Territorial out in your part of paradise–nicely sized and terribly prolific…and Argonaut, which are similar in shape to a Waltham butternut but much, much larger–the biggest one weighs in at well over 20 pounds, and I hear they can grow even larger. Both are delicious! It was a terribly good year here at what I think of as the squashery…altogether I grew an even hundred of them in a 35 x 45 – ft. space (plus about another 3000 egg gourds). I wish I could post a photo here, and you could see the group portrait of the haul! Wowwie! Did you grow all these beauties? On an island? In the Puget Sound? With that June-uary we had? Colour me astounded! What gorgeous squash…you have such a green thumb! You have the way kewl Iran Pumpkin? People are raving about this pretty little thing BUT you are the first PNW gardener I have come across who isn’t just lusting after her. I got a grand total of three pumpkins that are too pretty to cut up…. today. BYW love the board the first group was on. How long have I been stuck at school? You’ve gone all up-town on me, I like the new look. Thanks Joumana! Hopefully this pumpkin will not get lost in the translation. I remember your post about that amazing long wooden board. Love the pics of all the varieties of squash. 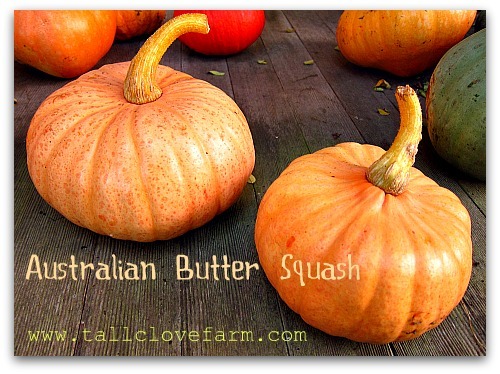 Australian Butter Squash is definitely on my list to try next year, I’ve been hearing lots of rave reviews about it from friends this season. I see you grew Boston Marrow this year! It’s definitely the biggest squash that grows in our patch. Not the tastiest, in that the flavor is on the mild side, but it did store very well for us last year. I like Galeux, and it has a wonderful aroma, although it can be a little watery after it’s roasted. It always gets a lot of attention though with those warts! mmmmmmm…I’m thinking I may have to make this for Thanksgiving…sounds too good to wait!